Thankfully, I’ve been able to make it to Pantone this week and last despite the apocalyptic snowstorms that New York has been experiencing. I can’t really complain because Toronto has had temperatures too cold to fathom (also because it’s in Celsius, still a struggle for me). The snow really shouldn’t cause too many problems in NYC because the subway is…underground…obviously, but a number of trains are still delayed. I also have to take a New Jersey transit bus to Pantone, which isn’t as bad as I thought it’d be but definitely not a pleasant ride (especially during rush hour in the Lincoln Tunnel, or waiting an hour just to get off the bus at Port Authority). I definitely don’t have the right to complain about commuting since a majority of my friends at Ryerson commute at least an hour, but I understand the struggle now and can’t say I don’t have moments when I don’t miss my 5 minute walk (run) to class from my apartment in Toronto. Munsell Color Test: I got a 12, meaning I only misplaced 3 little circles! If you want to give yourself a headache (jk it's fun), you can take it online here, but it's much easier in person. The lower the score, the better! Anyway, the commute is definitely worth it. My main task thus far has been assisting with the Digital Draw Down tool/process. I don’t know how in depth I can explain this because they only have one client that has used this so far (Tetrapak), but essentially a client’s colors are printed on a digital inkjet printer (i.e. the Epson Stylus Pro 4900 or Canon iPF6450 used in our lab). 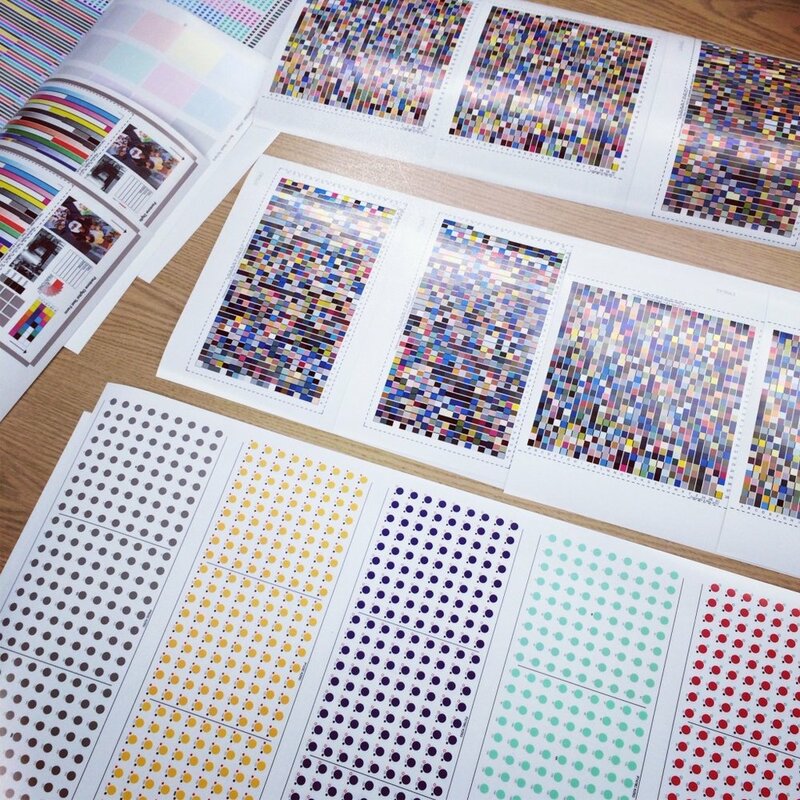 These printers can be roll or sheet-fed: the roll is used to print the test forms to find the closest color match (smallest Delta E) and the sheets are used to print 1 or 5 of the client’s colors as stickers, which can be used for extremely close and hopefully exact comparison of a product printed with a Pantone color. Last week, I made the printer profiles for both the Epson and Canon because that hadn’t been done in a year. That process involved making test charts, printing those charts, measuring the charts, and then making the profile with i1Profiler. This is a software to make test charts, measure test charts, and make ICC Profiles. With the profiles made, I printed the test forms that are made with the Digital Draw Down tool (the forms have a cool name but not sure if that can be revealed…and the software was made by the Technical Director and Color Scientist which is super cool!). They are 17x31.25” because they have about 60? small circles for each color (red, green, blue, yellow, and gray – the “virgin” color library that I’ve been testing). I printed a form on each printer last week, and again this week. Last week, I waited a day to measure the form from the Epson and a week to measure the Canon’s. I measured almost every circle to find the closest color match to the specified L*a*b* values for each color, also known as the smallest Delta E value. They use Delta E 2000 because it is most accurate and has solved issues associated with the other algorithms (like 94, CMC, and CieLab, which is what we use at school I believe?). From all my measurements it seems clear that the Epson has a larger printer gamut. 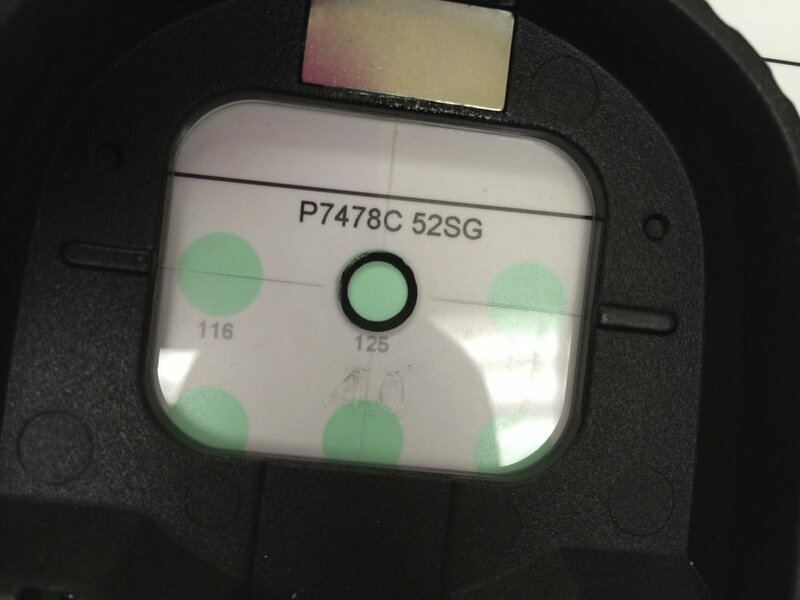 This will be verified by the Color Engineer, who needs to create the color spaces for each printer with the data from the measurements I did from the test charts this week. The Color Engineer is the one who actually makes the Pantone colors! If you actually read all of that, then thank you! It probably sounds like a bunch of nonsense, but I really enjoy what I’m doing and hope I’m also able to say that with whatever job I have when I graduate. Today I visually measured Fujifilm’s ink drawdowns in a light box under D65 lighting (used in Europe vs. D50 used in North America). The drawdowns are sent in envelopes of about 10 colors. They are all the same colors but different inks on various substrates, like coated/uncoated paper, plastic, cotton, etc. No tools were needed for the measurements since it was just visual but each drawdown that I’ve looked at so far (2 side by side) appear identical. I also measured the Pantone digital test forms that Konica Minolta sent in and test charts printed on their printer, which will be used to make profiles for their 2 new printers. Apparently companies like Konica Minolta give their printers codenames before they’re on the market so I guess I shouldn’t say those names either (** so many secrets ! **). Again, thank you if you read all that but it’s really just so that I can remember exactly what I did for class next year. Besides Pantone, I’m slowly learning German (thank you Duolingo) and making websites. I am very excited about the first real client I just acquired and can’t say how thankful I am for the class and the person that taught me web design just a year ago. I switched this blog over to my own domain because the site I used to host my website offered a free Wordpress blog. So now my blog uses my domain and has my favicon :) (it really bothers me when websites don’t have favicons, and the CSS is editable !! exciting !!). The next thing I want to learn is PHP so that I can learn how to redesign my blog’s template! O K this has been really long I think I’m done now.